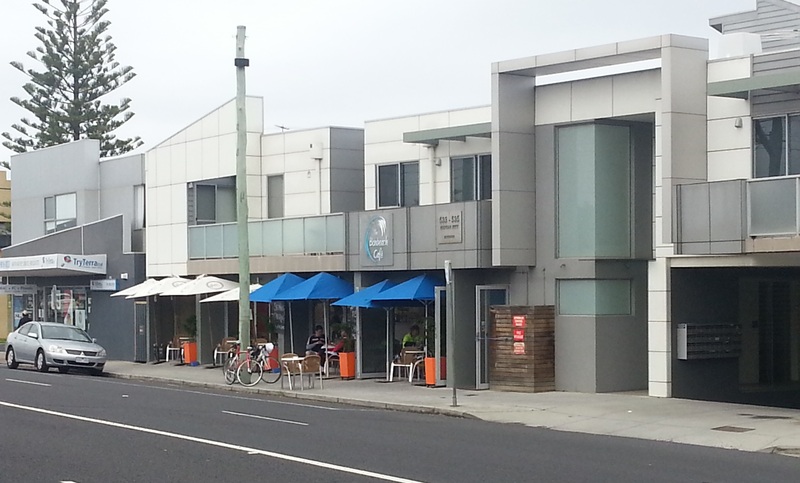 Across the road from Bonbeach Station on the beach side of Nepean Highway sits the Bonbeach Cafe. There aren't many shops either side of the cafe nestled under a residential block of apartments. It is quite large inside and must sit over 60 people, not including the outdoor seating that hugs the frontage. It has a huge stainless steel kitchen that can be viewed from the dining area and you can hear the chef moving about as he prepares the food. Nothing hidden from sight here! The breakfast menu was a bit unusual in that it had Hollandaise sauce listed as a side but did not have the staples of Benedict or Florentine eggs that always appear on breakfast menus. I had Breakfast Bruschetta - sourdough toast topped with avocado, tomato, ricotta and fresh basil; drizzled with extra virgin olive oil - it was delicious. 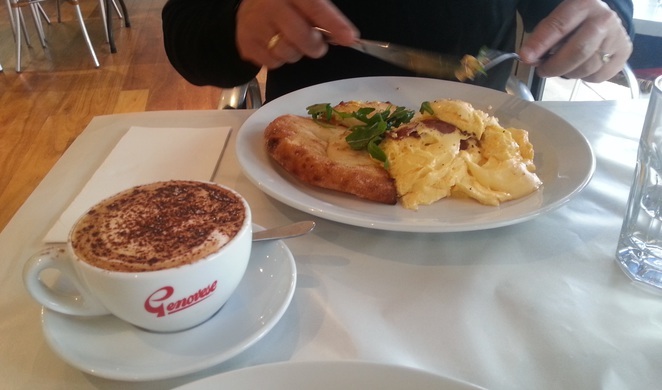 My partner had Scrambled Eggs with Chorozio Sausage and also enjoyed his meal. The coffee was also delightful and didn't let the side down. 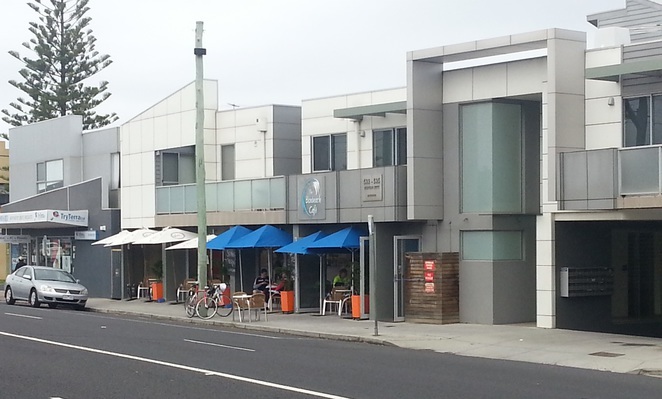 As we sat, talked and ate our breakfast we watched locals come in and buy take away coffee, fathers with daughters, couples and as we were leaving, cyclists began to arrive taking a break during their ride, perhaps heading back to the city, down Nepean Highway and back along Beach Rd? There are two businesses running out of the one site; a cafe and a catering business, both owned by Tony Funge. This cafe looks ordinary from the outside and there isn't the allure of great shops in close proximity, but the food is of the highest standard and it's a bit of a hidden gem in plain sight. I do wonder if this is the same Tony Funge who wrote "Great Temptations : Life Be in It Cookbook", if it it is that could explain why all the food is not only healthy but also tastes great!! Dining hours Monday to Sunday 8.30 to 3pm for Breakfast, Brunch, Lunch, Coffee and/or drinks. Public transport	- Directly opposite the Bonbeach train station. Access to local buses also. Kid friendly - a sign on the wall requests that children remain seated while in the restaurant which probably indicates that they must get a lot of small people custom during the week; there weren't any youngsters there when we went at 9am on a Sunday morning. Why? It's all healthy but you go there because of the flavours! When: Dining hours Monday to Sunday 8.30 to 3pm for Breakfast, Brunch, Lunch, Coffee and/or drinks. We love this place. 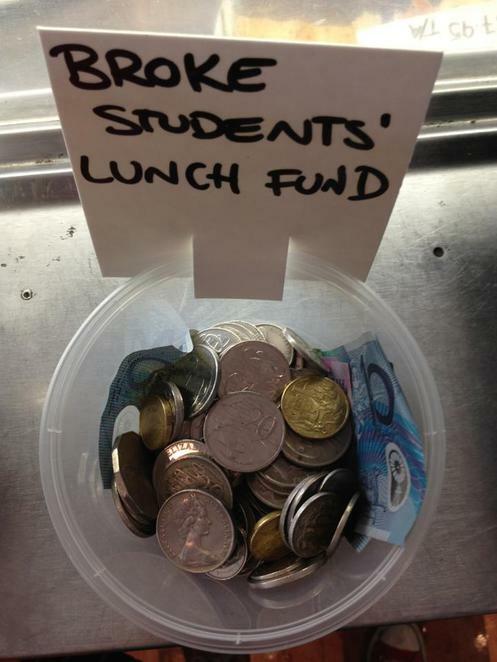 Great service, great food, great coffee. Lovely setting.